I thought you would be interested in some of the recent activity at Next Gen Personal Finance. We are developing engaging, real-world personal finance curricula for high school and college students that work great in a classroom setting as well as for independent study. Teachers have found our resources to be a great supplement to their existing curriculum. Questions of the Day can be good openers to get your class started off on the right foot with a thought-provoking question. What do High School Students Spend Most of Their Money On? How Do Lifetime Earnings Vary Based On Your College Major? Current events can be a great way to engage your students too. Here are some lesson ideas that come straight from the headlines. Reach out to me at tim@nextgenpersonalfinance.org if I can be helpful in any of your financial literacy efforts! This NGPF blog post was featured in NY Times article. Good list to share with students as freshman (or hopefully even sooner) so they understand the downsides of overborrowing. To get a student loan at Broward College, one of Florida’s largest community colleges, you first have to sit through a two-hour financial lesson with Kent Dunston. It’s a little likeScared Straight, the 1978 documentary designed to keep kids from ending up in prison. Dunston’s lesson, though, is about scaring students into making good financial choices. Nationwide, student loans total more than $1.2 trillion. And schools now face punishment — even closure — by the federal government if the rate is too high. The article goes on to describe the experiment at Broward which included limiting student access to subsidized federal loans, thereby eliminating unsubsidized federal loans and private loans as options. The school has not seen an impact on student enrollment and they HAVE seen declines in student defaults in the six years, since they implemented these programs. After the call that I had a few weeks back with a student on the road to a $100K+ student loan balance, I started thinking we need to expose students to the downsides of student debt BEFORE they choose a college. Honoring Teachers and Ideas for the Home Stretch! We crammed this newsletter with engaging ideas, activities and videos that we thought you and your students would enjoy as the school year draws to a close. We updated our website to make it easier for you to find lessons and activities, to allow you to sign-up for webinars and surveys and we added a quiz feature too! As we shift our focus to summer, we continue to think of ways to serve you better, including improved search capabilities of our resources, developing a question bank and creating new lessons in taxes and insurance. Please send me an email (tim@nextgenpersonalfinance.org) and let me know how we can help provide you with the resources you need to succeed in the classroom. Sign Up for Our Free Webinar on May 27th: "Infusing Current Events Into Your Personal Finance Classroom"
Students see current events every day on Facebook, Instagram and Twitter. As a teacher, you want to be ready to capitalize on that interest to teach important developments in personal finance. In a recent survey of NGPF users, over 60% said they felt "learning what's new in personal finance" would be important to share with their students. But it's hard to quickly turn a current event into a well-designed, engaging lesson, right? Wrong! Next Gen Personal Finance is here to help you learn HOW to take the great news story you read over your Sunday coffee, and tackle it with your students on Monday WITHOUT staying up all night toiling over a lesson. Click here for additional details and to register for this FREE webinar that you won't want to miss. How about learning about networking and the importance of LinkedIn bycreating a famous person's LinkedIn profile? Your students choose! Who wouldn't want to plan their family's summer vacation? They will learn about budgeting too with this activity when they learn they have to keep it under $1,600! Was a high schooler really able to accumulate a $72 million portfolio? Your students will enjoy playing financial detectives with this case study. It's all about the unit price!...your students will understand the importance of this concept after completing this engaging activity. Yes, unit price can be engaging. Try it and you will agree! We are hoping that NY Times columnist Ron Lieber's column on student loansspurred some family conversations about paying for college. 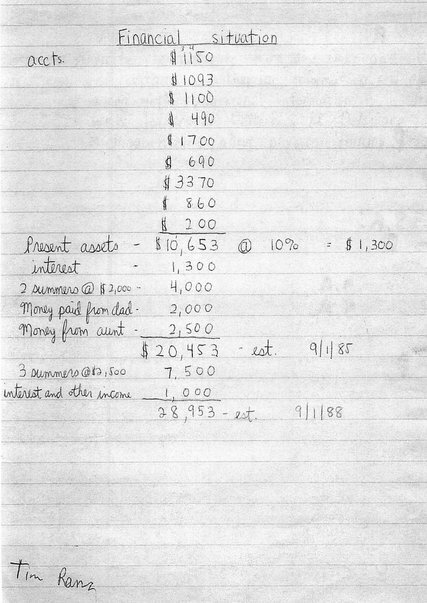 Check out the "financial plan" that I created when I was sixteen (which was highlighted in the story) and ask your students to create their own. Also featured was a video playlist that NGPF curated with the ominous title "Scared Straight Approach to Student Debt." We love taking current events and turning them into engaging questions that you can use to kick off your lessons. 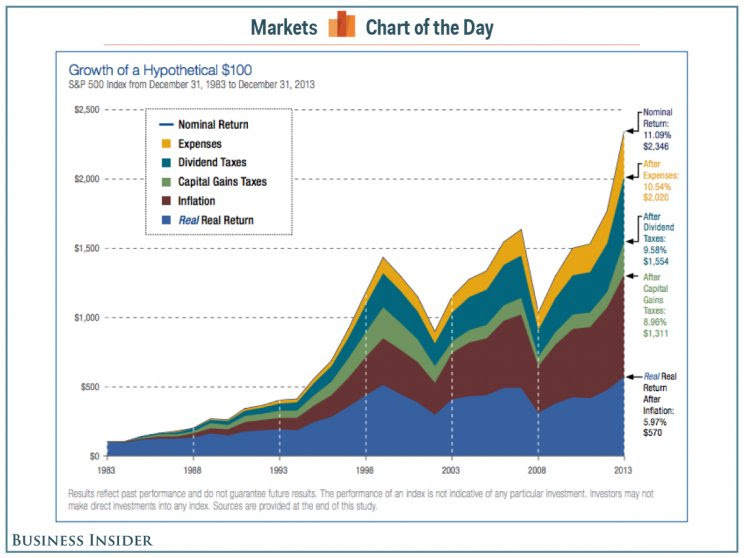 What Have Stock Market Returns Been Over the Past 90 Years? What Percentage of 18 and 19 Year Olds Don't Have A Credit Score? How Much Is That College Major Worth? Why Do Incentives Matter When It Comes To Financial Products? Thank you to all teachers who contributed resources and activity ideas to the NGPF Financial Literacy Month Contest. We are already looking forward to the 2nd Annual! I am excited to shine the spotlight this month on the work of Brian Page, a Finance, Economics and Business teacher at Reading High School in Ohio. 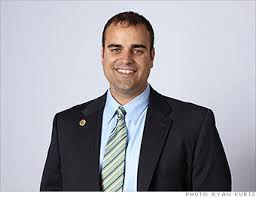 Brian has won numerous awards, including 2011 Milken National Educator Award and served as a member of the Presidential Advisory Council on Financial Capability. He also brought a NY Times reporter along for a memorable field trip to visit a pawn shopwith his students. Thank you to Brian for sharing his insights on strategies that work for him in the classroom. What personal finance lesson(s) or habits did you learn from your parents? I learned three important personal finance lessons from my parents. First of all, I learned about the important connection between money and values… prioritizing financial decisions based on what my family values most. Secondly, my father modeled and instilled the spirit of entrepreneurship in me. Most importantly my parents modeled and supported the expectation of a college education and the demands of being personally responsible. What is your favorite activity to do with your students? My two favorite activities with my students is my own co-creation, the Awesome Island Game… and Budget Challenge. Both are engaging hands on learning tools students respond well to. Budget Challenge is the bridge connecting what we're learning in the safety of our own classroom to the scary and complex financial world. Budget Challenge immerses students in an online interactive simulation where they compete with students from across the country for 9 weeks, road testing their own money management strategies. If you could make one change to the way personal finance is taught in this country, what would it be? If I could change one thing about the way personal finance is taught in this country, it would be the instructor and course requirements. NEFE found that only 1 in 5 teachers are confident in teaching all of the accompanying personal finance topics, yet legislative requirements and funding fall short of providing educators with the supportive professional development and certification requirements they deserve. Further, personal finance should be a semester long high school course devoted entirely to financial education instruction that is a graduation requirement. Ideally, the course would be a requirement for juniors and seniors and include broad ranging hands on learning activities, field trips, simulations, games… and focus on topics pertaining to the financial decisions teens make today, or will soon make. 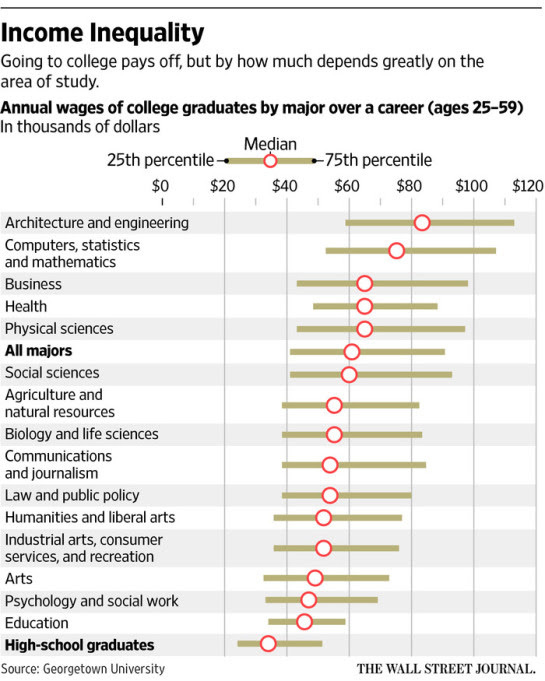 Chart of the Month: How Much Is That College Major Worth? Be sure to check out this NGPF Blog post for discussion points that accompany this chart. Next Gen Personal Finance actively supports the financial literacy community through workshops, conference sponsorships and volunteer teaching. We are based in the Bay Area but travel constantly so e-mail me attim@nextgenpersonalfinance.org, if you are interested in discussing a speaking or sponsorship opportunity. March 24, 2015: Free Webinar "How To Find Personal Finance Resources"
Welcome to Next Gen Personal Finance's April 2015 Newsletter: It's Financial Literacy Month! Awarding $1,500 in prizes to teachers. All you need to do is share your favorite online resources (video, article or interactive) and/or original classroom activity with an email to tim@nextgenpersonalfinance.org. Click here for details. Hosting a webinar on April 21st titled "How Do I Implement an NGPF Lesson in My Classroom?" Click here for details. Example: Who's Charging ATM Fees? And How Much Are They? Example: What if You Invested That Latte? Finally, I want to apologize for the email that was sent yesterday in error titled "This Is Our Fake Newsletter." I am happy to send you our real April newsletter today and wish you a wonderful month! We continue to garner positive teacher feedback regarding our latest product, theNGPF Activity Bank. What do they like about the activities? Oh, and we created Answer Keys (yes, they are free!) to make life easier for you. Please contact Jessica at jessica@nextgenpersonalfinance.org and let her know what you need. Debate: Should College Students Get Credit Cards? Sign Up for Our Free Webinar on April 21st: "How Do I Implement an NGPFLesson in My Classroom?" Click here for additional details and to register for this webinar that you won't want to miss. "The Questions of the Day are already prepared and spark interest as well as research skills. I don't have to spend hours coming up with a meaningful list. Love it!" What Are Three of the Most Dangerous Types of Identity Theft? What Is The Average Credit Score for 18-24 Year Olds? How Many of These Credit Card Myths Do Your Students Believe? What Is The Return on Investment For Your College Education? What is your favorite activity with students? 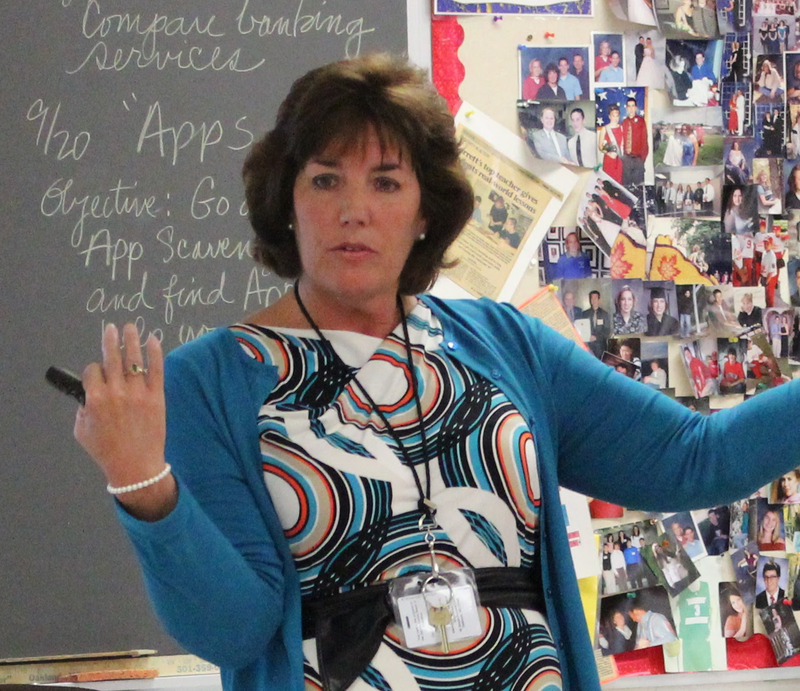 "Would you believe me if I told you my favorite activity is teaching students about Taxes? Without some planning and creativity, this could easily be a contender for the world’s most boring high school lesson, but when I use Take Charge Today’s “The Basics of Taxes” curriculum my classroom comes alive!" What is the most common misconception that you find among your students when it comest to money? "I don’t think high school students see themselves as economic decision makers; they’re still at the stage and age of life where they relate to the more simplistic idea that they fall into either the category of a Saver or a Spender. I think their misconception is that it’s alright to spend money without ever thinking about the consequences of their actions. When I poll them, it’s clear that many spend every dollar they have and don’t look to save." What concept do you find most challenging to teach your students? "Certainly investing can be considered one of the most challenging set of concepts to teach high school students. They have such little background knowledge on this subject, with few students ever having paid attention to the stock market. All of these lead to a challenging task for the classroom teacher. After implementing some traditional teaching strategies for getting students familiar with the vocabulary and content, an ideal way to allow students to fully engage in learning about investing is to have your class compete in the Council for Econ Ed Stock Market Game." 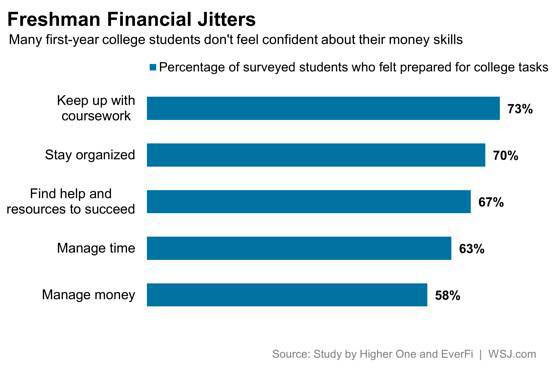 Chart of the Month: What Do College Frosh Worry Most About? Next Gen Personal Finance (NGPF) is a non-profit organization that believes all young people deserve a free, quality education to develop their financial capability. We have continued to build out the NGPF Activity Bank (see below for additional details), and now have over 85 FREE activities that are engaging, educational and extend the learning for your students. DEBATE: Should Employers View Facebook Profiles? March is National Reading Month. We know that finding high quality, interesting, and student-friendly articles about personal finance for a high school audience can be time consuming. All month, Jessica is highlighting one nonfiction article from our library each day. She's selecting her favorites for immediate use in your classroom. Celebrate #NationalReadingMonth with NGPF! Want To Get A Good Job? Better Learn Excel! Are Stocks A Risky Long-Term Investment? How are Credit Reports/Scores Changing? What is the Return on Investment For A College Education? How Can Minors Check Their Credit Report (and why would they want to)? Post YOUR favorite personal finance article. The poster of the article with the most likes by Friday will win the $50 gift card. 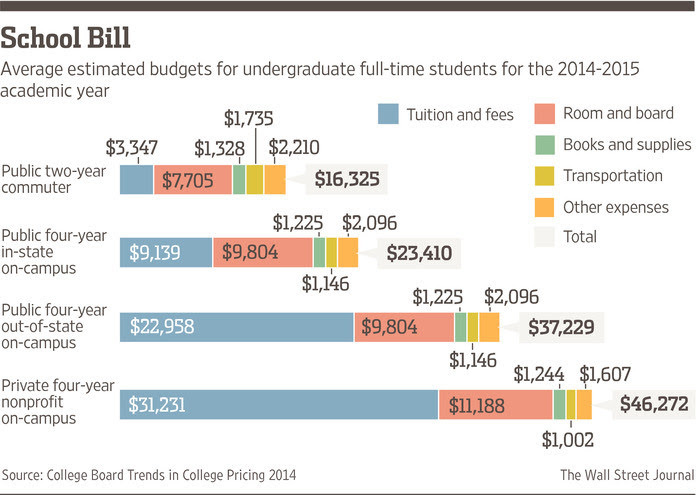 Chart of the Month: What's the Cost of College for 2014-15? Next Gen Personal Finance is excited to offer cash prizes to personal finance educators as a way to honor their work during Financial Literacy Month and to share top resources and activities with the educator community. Who is eligible? Personal finance educators at high school or college level. Five (5) $100 prizes will be awarded for engaging online resources (videos, articles, interactives) that you have found on the internet and used in your classroom. Two (2) $500 prizes will be awarded for original activities that teachers have created and used in the classroom. A short answer to “What do your students like most about this resource/activity? Are there limits to how many resources/activities that I can submit? Teachers may submit up to 5 resources and 2 activities. How will the submissions be shared with the community of personal finance educators? NGPF will post top submissions on the NGPF Blog, Twitter and our Facebook page. In addition, winners will be announced in our May newsletter. We recently received feedback from educators that you wanted ways to extend student learning and engagement in the classroom. We listened and are excited to announce theNGPF Activity Bank (click on Finance Activities on left side to find our 40+ activities). These 15-30 minute interactive activities will teach your students how to pick a checking account, create savings goals, understand the difference between a college's sticker price and "net price." We continue to add to our FREE Lesson Library (70+ lessons and growing) and the NGPF Blog, updated daily, provides you with case studies, questions of the day, and current event ideas and is updated daily. Check out our latest product innovation to engage your students with interactive, reality-based activities. Your students will learn to calculate, research, compare, debate, role play and create within these activities. Oh, and we created answer sheets to make life easier for you. Please contact Jessica at jessica@nextgenpersonalfinance.org and let her know what you need. Shopping with Interest: Students calculate how much items cost when factoring in credit card interest. Comparing Checking Accounts: Students conduct online research to compare and select a checking account. Create a Savings Goal: Students learn importance of goal-setting and brainstorm their savings goals. Compare Needs vs. Wants: Students prioritize their budget items and understand the role of values in how they spend their money. Activity Idea: What's Your Biggest Money Mistake? Better Read the Fine Print on This Credit Card! Do I Have To Pay To See My Credit Score? Making a Mobile Deposit on Your Smartphone? Read This! What is the Cost To Insure a Teen Driver? Interactive Map: What is the Most Common Job In Each State? Chart: How Much Of An Impact Does Your Credit Score Have On Your Interest Rate? 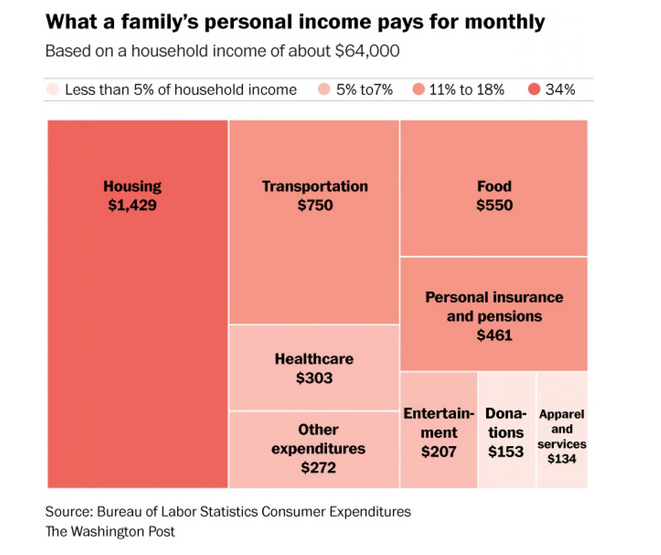 Chart of the Month: How Does The Average Household Spend Their Money? Next Gen Personal Finance actively supports the financial literacy community through workshops, conference sponsorships and volunteer teaching. We are based in the Bay Area but travel constantly so e-mail me at tim@nextgenpersonalfinance.org if you are interested in discussing a speaking or sponsorship opportunity. We hope you enjoy our first newsletter of the New Year. My goal is that you will find at least one engaging idea (and hopefully more!) that you can use in your classroom immediately. This idea might be a lesson from our FREE Lesson Library (60+ lessons and growing) or an activity, question of the day, lesson idea or current events analysis that comes from the NGPF Blog. With college acceptance letters and financial aid packages right around the corner, there is no better time to announce the launch of NGPF's Paying For College unit! Grants & Scholarships: Free Money! What Do I Need to Know Before Completing the FAFSA? What's The Difference Between Sticker and Net Price? How Do I Calculate The Value of A College Education? What Is Your Investing Risk Profile? Online Simulation: How Does Online Banking Work? Who Has the Best Wireless Phone Plan? What Is Your Financial Resolution? Checking Accounts: A $4.95 Fee To Not Overdraw Your Account? Do You Want Free Data On Your Smartphone? If You Dropped a Dollar In the Mall, What Are the Odds It Would be Returned? What Percentage of Consumers Find Errors In Their Credit Reports? What Does It Cost To Make Our Most Popular Coins? How Much Would I Need To Save Monthly To Have a Million When I Retire? We often see stock market returns described in media reports in nominal terms, such as the S&P500 returned over 13% in 2014. Well, it turns out as a result of expenses, taxes and inflation, the REAL returns are often much lower. Which of these can investors control to maximize their real returns? See this NGPF blog post and find out. Next Gen Personal Finance (NGPF) is a non-profit organization that believes that all young people deserve a free, quality education to develop their financial capability. We hope you enjoy our second newsletter. It was gratifying to see the interest, emails and calls that came from our November newsletter. You confirmed our hopes by telling us that you found ideas/activities that you could incorporate into your classroom. We love your feedback so please let us know how we can continue to serve you. Also, please be sure to bookmark our FREE Lesson Library and check back frequently as each month we will be adding new lessons (check out our Investing Basics lesson which we recently added). Case Study: Millionaire or Not? We have to create savvy consumers to navigate the minefield called the financial services industry. Our What's the Catch? posts provide students with opportunities to develop their financial savvy. When Is a "Free" Checking Account Not Free? Can I Really Get Free Access To Credit Scores? Why Was Black Friday So Glum For Retailers? What's The Right Amount Of Student Debt? Which Checking Account Is Better? Should High School Students Get A Part-Time Job? 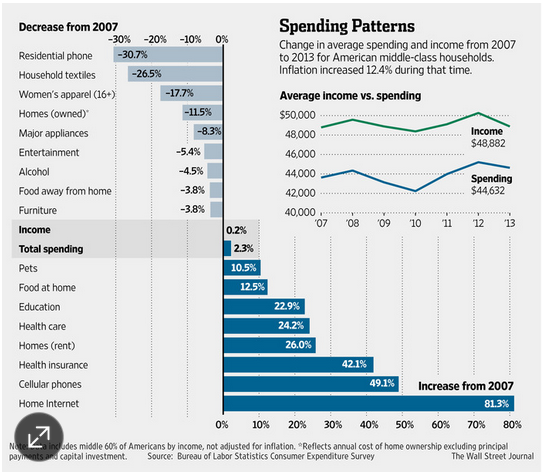 This set of charts shows how spending patterns for middle-income families have changed over the last six years. See what insights student glean from analyzing these charts. Why Don't People Give More? What Financial Fears Do Adults Have? Next Gen Personal Finance actively supports the financial literacy community through workshops, conference sponsorships and volunteer teaching at local high schools. Contact us at tim@nextgenpersonalfinance.org if you are interested in discussing a speaking or sponsorship opportunity. Four years ago, I started teaching personal finance at an East Palo Alto, California high school and spent dozens of frustrating hours doing Google searches to find that "perfect" resource for my students. At NGPF, we spend hundreds of hours finding those "perfect" resources for YOU, package them into engaging lessons and create rich performance tasks to ensure students can apply their learning. Check out our FREE Lesson Library, which now has over 50 easy to implement lessons. My hope with this newsletter: You will find a few ideas that you can implement immediately in the classroom. We love your feedback so please let us know how we can continue to serve the personal finance educator community. What is the Lifetime Value of a College Education (By Major)? What is the Highest Interest Rate I Can Earn on a Standard Savings Account? What is the Preferred Method of Payment for Consumers? Top 5 Lessons. These Next Gen Personal Finance lessons proved most popular to educators visiting the NGPF Blog. We build our free lessons by curating web content, including videos, articles and calculators and creating our own performance tasks. Chart of the Month: They say a picture tells a thousand words. 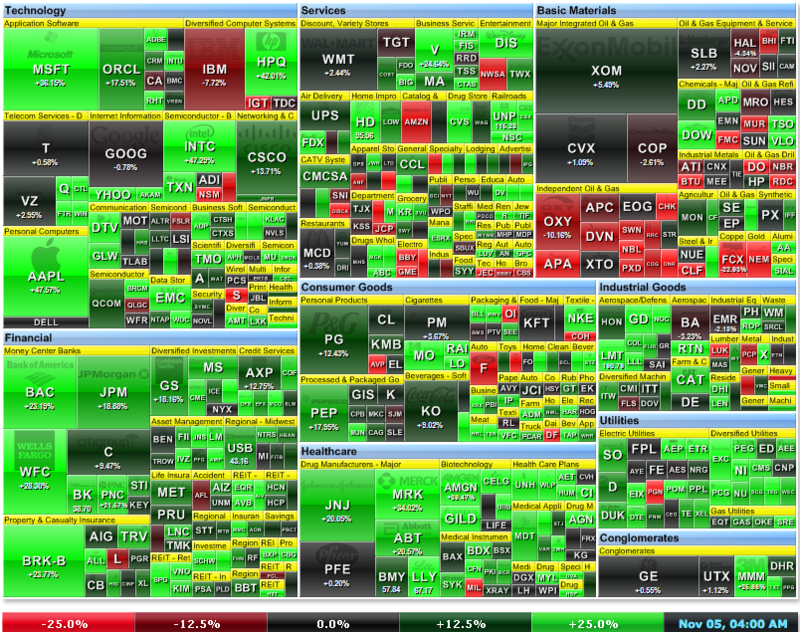 How about one picture showing 500 companies? Check out the chart in this post(larger image appears in blog post) which provides a graphical representation of the S&P500 while also reinforcing investing concepts such as diversification and return on investment. How Do Consumers Pick Checking Accounts? Three research studies at the top of this postdescribe the psychology behind credit card usage. Is There Balance In Your Life? How Did One NBA Star Lose $110 Million While Another Earned Hundreds of Millions After His Playing Career Ended (Video)? What are new credit cards going to look like? Apple Pay had a million credit cards entered in first three day. Debit cards have hidden dangers that your students should be aware of. We also provide regular updates on credit scores, student loans and investing. Well, it's been several years since I last checked in and I hope you are doing well. So what have I been up to? In a nutshell, pursuing my passion: personal finance education. I have spent the past few years in the classroom teaching personal finance at Eastside Prep., an inspiring place which sends 100% of their first generation students onto college. I created my own curriculum with an emphasis on honing student decision-making skills in a real-world context. My students loved divining the mysteries of the credit card disclosures ("Schumer Box"), analyzing checking account fee schedules to calculate the cost of overdrafts and developing a critical eye while watching credit card ads. The engagement of my students led to the launch of a new non-profit, Next Gen Personal Finance. So, what is Next Gen Personal Finance (NGPF)? We have developed a FREE curriculum that combines curated web content with engaging in-class discussions and projects. We have found the best videos, articles, interactives and simulations from the web and combined them with assessments (to check for understanding) and engaging, "real world" projects to build student's decision-making skills. Students learn by doing and with NGPF, we currently have 30+ lessons on credit cards, checking, saving, credit scores and budgeting (lessons on paying for college, investing and careers will be released by November 1st). Oh, and it's easy to implement in a workshop format or through independent student work! I know many of you share the passion I have to improve the financial education of our young people. Please reach out to me at tim@nextgenpersonalfinance.org if you are interested in learning how NGPF can help you further your goals. I look forward to talking soon!